What’s interesting about Racine landscape lighting is that people rarely realize the multitude of benefits to be gained until they either learn more about them or have them installed. While it obviously looks pretty there is so much more to it than that. So if you have ever considered exterior lighting like this, there are some things you should know. 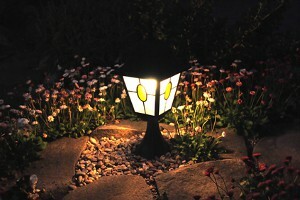 Focal Points – Since the main reason for adding landscape lighting is the look then this should be addressed first. If you are going to invest the time, effort and investment into having professional landscaping then you want to be able to showcase it day and night. But keep in mind, carefully placed lighting also hides any features of your home or property you don’t want noticed through careful lighting placement. Security – While homeowners rarely think of this reason it is actually one of the best reasons to get this lighting. A well lit yard gives criminals less of an opportunity to find a place to break in or vandalize a home. So if someone is looking for a quick and easy target they are going to bypass your home. Safety – Another commonly overlooked advantage of well planned Racine landscape lighting is safety. If you or your family members or guests intend to ever spend any time outside at night around your home than you owe it to them to add this type of lighting. It is not only the responsible thing to do for the care of your loved ones, it is also a good way to prevent the possibility for incidents that could end up leading to an injury lawsuit. Comfort – Stop limiting yourself to enjoying time only inside your home. With the right landscape lighting you could be enjoying your deck or other outdoor seating area whenever the mood hits you. This paired with a fire pit and you could even be outdoors during the cooler winter months. If you are ready to find out more about adding this to your home then you should give the CJS Lawn & Landscaping team a call. Another bonus is that well planned and expertly installed lighting like this will also increase the property value of your home. With so many great reasons to consider this, why not get started? We look forward to planning out your Racine landscape lighting and helping you and your family truly enjoy it. You are going to wish you had done this so much sooner. So why put it off another day? If you are looking for a Racine landscape lighting professional, then please call 262-878-1660 or complete our online request form.